"I just heard that your uncle is dead," said the message on my voicemail. "It’s terrible." A phone call from Guy Combs in Alpine informed me that Dr. Barton H. Warnock, or "B.H." as my family always called him, had died behind the wheel of his automobile out on Highway 67 to Fort Stockton. I can’t say that it was a total shock, because he was 87 years old and had lost Ruel, his wife of more than 60 years, just two years earlier. But the last time I spent a day with him he appeared to be in good health as he drove me through Big Bend Ranch State Park, showing me some of his favorite places. Still, it had been getting harder for him to get around, and a friend in Marathon had told me she was worried about him because he was getting forgetful. But nothing seemed amiss about his death, and I went on thinking nothing was out of order. My first inkling something was wrong came two days later, when I got a phone call from Diann, my wife, while I was acting as a leader at my son, Roland’s, Cub Scout Day Camp. "You’ve got a phone call from the funeral home in Alpine," she said. "They need you to sign the cremation papers." It was no secret that B.H. wanted to be cremated. That is what Ruel had requested for her funeral, and B.H. and son Tony had scattered her ashes in a canyon in the Davis Mountains that was their favorite picnic spot. His final wish was to have his ashes scattered beside hers. Mel Wideman, owner of the Geeslin funeral home spoke with me on the telephone and told me that Tony could not be located. I told him that Tony worked for the Los Alamos Labs in New Mexico (the same one that was in the news recently about Wen Ho Lee) and that they should contact him. Mr. Wideman said that they had tried, but Tony was in Sweden and could not be reached. He said that there was a woman in the funeral home who claimed to be Dr. Warnock’s wife, but she could not produce a marriage certificate. Could I, as next of kin, authorize the cremation? I assured him I would and went about filling out the necessary papers to fax to him. I knew about the woman in the funeral home, Rebecca Vogt, from Kathleen, my mother. Back before New Year’s Eve, B.H. had called Kathleen to invite her to a New Year’s Eve party. He told her he had met a woman named Rebecca, and wanted mom to meet her. My mother declined, because she had other plans, but she was concerned about the arrangement because Rebecca was 43 years younger than B.H. I didn’t think that much of it at the time, because I was glad that B.H. had some company and a woman who could help him. Little did I know at the time just how much "help" she would be. Mom hung up the phone with the comment, "There’s no fool like an old fool." The next time I spoke with B.H. was in February of 1998, when I asked him to come to our Best of the Big Bend ceremony. He respectfully declined, saying that his knees were giving him trouble and, "I don’t want everyone to see me crippled." I had tried to call him once or twice after that, but because he had no answering machine or voicemail, I could not leave a message when he didn’t answer. Ruel Warnock in Alpine in 1967. Now it was June, 1998, and he was gone. I left a long message for Tony to hear on his return. I apologized for having to sign for the cremation, because I knew that Tony would have liked to handle that himself and asked him to call when he returned. I spoke with Rebecca once or twice by telephone, told her that Tony was coming and asked her to have the house in order for his arrival. The house I referred to was B.H. and Ruel’s home in Alpine, where Tony had been raised. I had visited it numerous times growing up. Every Christmas and summer when we visited my grandparents in Fort Stockton, we always went down to Alpine to spend a day or two with B.H. and Ruel. I was totally unprepared for the next phone call I received from Tony. He was on his cell phone, calling me from his car as he and wife Maryam were driving back to Los Alamos. His voice was a morose monotone, like a man who had been gut shot. "There’s nothing there," he said. "I’m going home." "What do you mean there’s nothing there?" I asked. "Everything’s gone," he replied. "The bank accounts are all closed out, the house, all the property is in her name. The safety deposit box is empty. She’s got everything. I can’t even get dad’s ashes. She went by the funeral home and took them." I was flabbergasted. If there was one thing that B.H. and Ruel always did whenever I was in their presence, it was to brag on Tony. He was the apple of their eye, a good son, and someone who constantly made them proud with his outstanding academic accomplishments. To have everything left to a woman who had come into B.H.’s life in the last 10 months sounded awfully fishy. I wondered how the estate had been transferred to Rebecca. Had B.H. changed his will to disinherit Tony? Why would he do that? I had never heard him speak an ill word against Tony in my entire life and just could not comprehend how this had happened. How had she gotten his ashes, when the funeral home would not even allow her to sign the papers for the cremation? She wasn’t a relative, nor a spouse. When I called Judy Wideman at the Geesling Funeral Home, she told me that "This woman (Rebecca) came in here, and got very ugly with us and demanded the ashes, so we gave them to her." Amazingly, in Texas there is no law guaranteeing the kin the rights to the deceased’s remains, so now Tony could not even lay his father to rest. She had his ashes, although she did not know where they were to be scattered. I soon discovered that his will had not been changed. It left everything to Tony. The transfers of property, money, even the trust fund that Ruel built for Tony, took place in Monty Kimball’s office, in January and February, just four or five months before B.H. died. When I told my mother what had happened, her first response was, "We should have held an autopsy before the cremation." Now we didn’t even have the ashes to run an analysis. The next odd occurrence happened in July, when I found a message on my answering machine from a man who identified himself as William Lewis. I had planned a memorial service for B.H. in Marathon. As part of the gathering, we were asking folks to donate to a scholarship fund to be established in his name. "This is William Lewis," the message went, "I represent Rebecca Vogt. You need to call me." I returned his call, only to be told that Rebecca Vogt now owned all rights to Barton H. Warnock, including use of his name, and that any money we raised for a scholarship fund in his name would belong to her. I hung up the phone, seething. To have someone who is not even a Warnock tell me that I cannot use the Warnock name sent my blood pressure through the roof. After several agonizing long-distance phone calls, Tony decided that he would name me executor of the estate and I would try to find out what happened to 60 plus years of B.H. and Ruel’s hard work. Publishing Big Bend Quarterly keeps me in touch with a lot of people in the area, so I set out to find out just what the last months of B.H. Warnock’s life were like. They were, in my mother’s words, "people who had a lot of acquaintances, but few close friends." One of those close friends was my father, Frank B Warnock. He and B.H. grew up together in Fort Stockton, and despite being related actually liked each other. While B.H. was making headlines as a standout halfback for the Fort Stockton Panthers football team, Frank B was in the marching band. But they both shared a passion for academics, earning good grades throughout high school. When B.H. was a student at Fort Stockton High, he became smitten with his music teacher, Ruel Turner. Shortly after he graduated from Fort Stockton High they were married. He always liked to grin and tell me, "I liked my teacher so much that I married her." He went to Sul Ross on a football "work program," because they did not offer scholarships. As big a star as he was at Fort Stockton, B.H. was even bigger at Sul Ross, where he earned the nickname "Star." B.H. 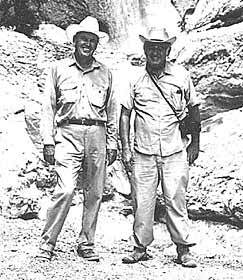 and Omer Sperry in the Chisos Basin, 1948. 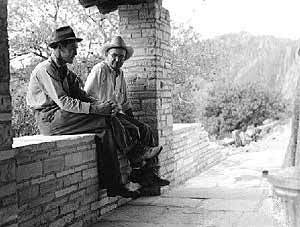 It was during this time at Sul Ross that he became so closely connected to Big Bend National Park, serving as a student researcher for Ross Maxwell, the park’s first superintendent. B.H.’s job was to catalog all of the plants in the park for the federal government. He literally walked over every foot of the property searching for plants and cataloging them. When he headed down to the University of Texas at Austin to pursue his doctorate, Ruel helped support him by teaching music lessons and baking cakes to sell. With his PhD in hand, he returned to Alpine to join the faculty at Sul Ross where he headed up the science department for over 33 years. His legend grew during his Sul Ross tenure, as he taught nearly every leading individual in the Big Bend — from Jane Sibley to Pete Gallego, all spent time under the tutelage of B.H. Warnock. He also combed the vast stretches of private ranch land that make up about 90 percent of the Big Bend, collecting plants and cataloging them. Along the way he met just about every landowner in the region. This 60-plus years of research made him the leading authority on not just the plants, but archaeological and geological sites as well. Through it all he remained devoted to Ruel and Tony. That was why leaving all of his property and possessions to this Rebecca Vogt woman seemed completely out of character to me. Tony wasn't born to B.H. and Ruel, they chose him. Ruel was unable to have children, so she and B.H. adopted Tony. If anything, this made him more special, and they lavished attention and affection upon him. It was soon apparent that Tony was indeed someone special. B.H. and Ruel were both brilliant people — some would call them geniuses. Tony was smarter than both of them. Just as a prophet is not recognized in his hometown, genius was unrewarded in Alpine, Texas in the 1940's and 50's. In the west Texas of that era, toughness and physical strength was more valued than brains. Tony graduated as valedictorian of his Alpine High School Class, but he endured an unbelievable amount of teasing because he was "an egghead." According to long-time friend Bill Lockhart, whenever kids got into an argument about the rules of a game, Tony could quote the rules, word for word. This made them mad at him and they wouldn’t ask him to play anymore. It also wasn’t very hip to be an academic in the land of high school football, cowboys and oil field workers. Part of the problem was simply that Tony was ahead of his time. He was a computer nerd before it was cool — Bill Gates in the land of John Wayne. Math and science were his forte. He was so fascinated by a new technology called computers that he received an academic scholarship to the University of Wisconsin and earned one of the first degrees ever offered in computer science. After getting his Ph.D., he returned to Alpine to teach at Sul Ross, alongside his father. While B.H. taught biology and botany, Tony taught math. It was during this time that Tony met his future wife, Maryam, and they were married. A few years later he got the call from the Los Alamos National Labs to serve as a computer programmer for the top scientific facility in the world. He jumped at the chance and moved to New Mexico. B.H. and Ruel were busting their buttons with pride. Tony was now at the top of the heap as far as math and science were concerned. Just who was Rebecca Vogt? 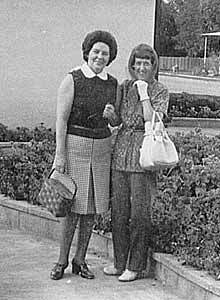 Through talking to some people around Alpine she was portrayed as a 45-year old divorcee who came to the Trans Pecos from Austin. In Austin she had been a practitioner of what she called "archaic technology." To elaborate, it is using native plants to weave baskets for museum displays. In other words, she was a basketweaver. In the past 10 years, a new group of people has moved into Alpine, Marfa and the Big Bend. Previously this country was populated with ranchers, cowboys oil field hands — hard-working outdoor people. Now, self-proclaimed "artists," adherents to New Age philosophy, holistic healing folks and people seeking "spiritual connections" have come in and set up shop. However, there is a shortage of housing because most of the property is still owned by the old-timers. If they are not making any more land, how do you get some of it? One way is to buy it, if it is even for sale. The other way is to inherit it or marry into it. My first question was how does a 45-year old basketweaver from Austin, Texas hook up with B.H. Warnock? According to her deposition, she claimed that she met B.H. when she was researching how Indians made dyes for their clothing and discovered that a bug that lives in prickly pear cactus, called the coucimil, was the source of these dyes. Ms. Vogt testified that she met B.H. at the Ponderosa Cafe in Alpine. He supposedly was interested in her bugs-as-Indian-dye theory and offered to help. I also discovered that shortly after B.H.’s death, a man named William Lewis Bradberry, or William Lewis as he represented himself to myself and some folks in Alpine, was seen in her company. The two of them went to the bank, the insurance company, and the automobile registration to make certain that everything, even B.H.’s cars, were all in Rebecca Vogt’s name. This William Lewis character even had to audacity to go into the Tally-Reed Insurance office in Alpine and tell Randall Reed that he and Rebecca wanted the $10,000 accidental death payment on B.H.’s auto insurance because he had suffered his heart attack while driving! All totaled, she now had in her possession over $1 million in real estate, stocks and cash, the biggest chunk coming from a nearly $500,000 trust fund at Edward Jones that Ruel had built up for Tony over a 30 year period of careful investing, purchasing stocks on B.H.’s modest Sul Ross salary. Tony was named as the beneficiary on the trust, so there was no doubt it was to go to him. In my efforts to find out how all of this money and real estate were transferred, I received little or no help from the First National Bank in Alpine or Jim Pogue at Edward Jones, the brokerage house. Both institutions refused to offer any help, saying that all of the information I was requesting was proprietary because it now belonged to Rebecca Vogt. Edward Jones’ Jim Pogue and the First National Bank of Alpine insisted that they were under no legal obligation to notify Tony Warnock of what was happening when B.H. awarded his accounts to Rebecca Vogt. This was most troubling to me, because Tony’s name was on the bank accounts at First National of Alpine, and he was named as the beneficiary on the trust fund at Edward Jones. According to both of these institutions, if an 87-year-old man with senile dementia comes in and revokes a $500,000 trust fund, then goes to the bank and changes all of his bank accounts, no one thinks it proper to pick up the telephone and call his son to say, "I think you better check up on your dad." While I understand that they had no legal obligation to do this, the moral obligation and common sense factor should apply. Wouldn’t you want this much consideration from your bank or stockbroker? The First National Bank of Alpine and Jim Pogue’s defense of their actions reminded me of President Clinton’s response in his deposition ("That depends on what your definition of ‘is’ is.") and Al Gore’s, "No compelling legal authority," defense. The other puzzling incident was his ashes. They were at the Geesling Funeral Home, until one day Ms.Vogt came in and demanded them. I couldn’t understand how someone who was not the next of kin, who couldn’t sign for the cremation, wound up with B.H. 's ashes. I then discovered that there is no law in Texas to prevent this from happening. We had to file a motion with the court asking for their return. It wasn’t long until I found out that all of the documents transferring the property and trust fund were drawn up by Monty Kimball, a lawyer in Alpine. Kimball drew up these transfers after Steve Houston, B.H.’s lawyer and the county attorney, had refused to do so. According to Steve Houston’s sworn deposition, B.H. came to Houston’s office one morning after Ruel’s death, asking for help settling the estate. "What is all of this stuff?" he asked, unaware that Ruel had amassed such a sizable trust fund, CDs at the bank, and municipal bonds in her lifetime. Ruel was always the one who handled the money, and B.H. was basically ignorant of how much she had built up over 50 years. She was known as an astute stock picker, and several times asked my mother to give her some money to buy stocks. "I’ll make you rich," she said, but my mom always declined, choosing instead to place it in safer, but lower yield, investments. In January of 1988, about two years after Ruel had died, B.H. was waiting outside Steve Houston's office when he arrived. He went into Houston’s office after he unlocked the door and asked him to change his will to leave everything to Rebecca Vogt. Houston knew that B.H. had not been in his right mind lately, and testified in his deposition that he recognized the symptoms of dementia. "I had seen it happen to my father," he said. He then told B.H. that he would be happy to do so, once B.H. and Rebecca were married, but it was not a good idea to change your will until after you were married. B.H. came back a few days later, with Rebecca Vogt in tow, and asked Steve to explain to her why he couldn’t change his will. Houston explained again that he would be happy to do so once they were actually married, but he would advise any client, no matter their age, that it was bad business to change your will without marrying. It was after this episode that Rebecca Vogt and B.H. went over to Monty Kimball’s office. According to Monty Kimball’s sworn testimony, Rebecca Vogt was his client, not B.H. Warnock, meaning that an 87-year old man with dementia had no legal representation. Kimball also later testified at a State Bar hearing that Ms. Vogt did not pay him a retainer, and paid him his fee, only after he had transferred B.H.’s assets to her. When Ms Vogt and B.H. went over to Kimball’s office, Steve Houston (according to sworn testimony) telephoned Monty Kimball to warn him that, "Dr. Warnock is suffering from dementia. He doesn’t know what he is doing. You better be very careful." Kimball ignored this advice, and drew up the series of transfers that slowly gave away everything Dr. Warnock owned, all to Rebecca Vogt. A day or two later, B.H. was over at the First National Bank in Alpine getting his safety deposit box drilled because he had lost the key. Accompanying him was Rebecca Vogt. Steve Houston received a phone call from someone in the bank telling him about this. The next day, at the Alpine Post Office, Houston asked Dr. Warnock who that woman was who was with him at the bank. According to Steve Houston’s deposition, B.H. gave him a blank look and replied, "I wasn’t at the bank yesterday." Houston wasn’t the only person around Alpine to be concerned about Dr. Warnock’s mental condition. B.H.’s own physician, Dr. Pearce, testified in his deposition that Dr. Warnock, "had good and bad days, and on bad days he had trouble remembering what he was doing. Of course he was taking buckets of medication." Ken Novak, his barber, told me that B.H. came into the barbershop one day asking where the water company was because he had to pay his bill. "He lived in Alpine all his life," said Novak. "He should have known where the water department was." And Marilyn Shackleford and Bill Stevens at the Gage Hotel recalled the day that B.H. sat in the restaurant for six hours waiting to meet someone on the wrong day and week. Try as they could, they had difficulty convincing him that he was there on the wrong day. "I would testify to anyone that Dr. Warnock was not in his right mind," said Bill Stevens. But the more compelling story came from Red Patillo, Brewster County Commissioner and long-time coffee drinker with B.H. at the Highlander Restaurant. "We all knew that this girl was probably taking advantage of him, but we couldn’t talk to him about it. Whenever I brought it up, he would get mad at me and say that she needed money for an operation, or that she needed help and he wanted to help her. "He (B.H.) had been such a strong, independent person for so long that it was hard for us to try and tell him what to do. We knew that she was taking advantage of him, but we didn’t realize how much." When I accepted the responsibility of becoming the executor of B.H.’s estate, I told myself that if I found any proof that he really wanted to give Rebecca Vogt everything he owned, I would not pursue the matter any further. But after spending several days talking to people around Alpine, I did not come across one person who said, "Oh, yes, he loved that girl and wanted her to have everything." Instead I got a portrait of a lonely widower, taking tons of medication (including a prescription for Alzheimer's!) and a man whose mental capacities had diminished. Did Monty Kimball and Rebecca Vogt simply catch B.H. on a "bad day" when he was not certain what he was doing, and get him to sign property over? The fact that the transfers of real estate and money took place over a series of seven different transactions led me to believe this was the case. I also became aware of a con job known as a "sweetheart scam." NBC’s Dateline did a detailed program on this scam, which consists of younger women finding lonely, old widowers and lavishing attention upon them to gain their life savings and property. Had Rebecca Vogt pulled off a sweetheart scam on B.H.? In my opinion, all the evidence pointed to it, mainly Ms. Vogt’s actions right after B.H.’s death. She wasn’t exactly in grief mode. Right after he died, she contacted Roy Armstrong at the Century 21 realty in Fort Stockton to appraise B.H.’s house for sale. When Mr. Armstrong quizzed her as to why she wasn’t using a real estate agent in Alpine, she replied that "she didn’t like the ones in Alpine." While this isn’t a crime, I believe it was to sell his house without anyone in Alpine being aware of it until the sale was done. She also went on a check-cashing spree, driving to Fort Stockton to cash three checks for about $3,000 apiece at two different banks from B.H.’s accounts. She then purchased a new club cab pickup truck for herself, paying cash for it, and bought her son a new Jeep, again paid for in cash from B.H.’s accounts. Then she left on a cross country trip with her friend, William Lewis, traveling to Colorado, Louisiana and Arizona. She also wrote a retainer check to the law firm of Hance, Scaroborough and Wright in Austin. But the most disturbing action was that she left town on her trip with William Lewis and just completely abandoned B.H.’s house. When I drove by it in the summer of 1998, it was neck high in weeds. In talking to the next door neighbor, Mr. McFarland, I was told that no one had been there in months. I rented a lawnmower and weed eater, and with my two sons, Roland and Travis, cleaned up the yard, because it hurt me so to see the property going to seed. I went to the house one weekend in August, accompanied by John Mac Carpenter and Dan Ruck, to see what the heck was going on. The house was practically empty, with no sign of life, or that anyone had even lived there for the last three months. As we were standing in the empty living room, wondering where everything went, a young man came in and introduced himself as Jeff Cafey. He told us that Rebecca and William Lewis had asked him to watch the house while they were gone. I introduced myself, showed him my papers naming me as executor, and asked what had happened to all of the stuff in the house. He replied that William Lewis had paid him to move it all to some storage units. "Where are William Lewis and Rebecca Vogt now?" I asked. "Oh, they are all over the country," he replied. "They’ve got a cell phone and they call me every now and then from Colorado, or New Mexico," he said. I then asked if I could see the items in the storage unit. "Sure," he replied. "Do you want the keys?" After discovering what I had reason to believe was evidence of fraud and a con job, I filed a lawsuit against Rebecca Vogt to recover Dr. Warnock’s estate. We filed a lis pendes (a legal term) to prevent her from selling any of the real estate until the lawsuit was settled. We soon discovered why Ms. Vogt had written that retainer check to the firm of Hance, Scarborough and Wright the month after B.H. died. She was now represented by a Geoff Weisbart, a lawyer out of Austin, with all legal fees paid for by the money she had gotten from Tony’s trust fund. In short, we were getting shot at with our own bullets. I also managed to pick up a nice lawsuit, when Ms. Vogt filed a slander suit against me seeking a million dollars in damages. If you have ever been a party to a lawsuit, you already know the following: 1) the courts move at a snail’s pace 2) we are a nation of laws, not justice 3) the only party who wins in a lawsuit is the lawyer, because he gets paid win or lose 4) no matter how compelling the evidence, your fate will be decided by a jury of varying intellect (see the O.J. trial). Without going any further, I would advise anyone even thinking of filing a lawsuit to reconsider your actions. That said, I felt fortunate enough to have a good friend and college fraternity brother, Dennis Fuller, represent us. He was very up front about the whole thing. "This whole thing smells from the get-go," he told me, "But you have to remember that when you walk into a courtroom, anything can happen." He also told us that proving undue influence was a tricky proposition because even if you have testimony that B.H. would forget things or have bad days, we would have to prove that he was not in his right mind on the very day he signed a document. "For every witness you have who will say he was incompetent, they’ll get one of Rebecca’s friends to say he was all right." What unfolded over the next two years were a series of depositions, motions and largely no movement. The only light moment in the case came just before her attorney, Geoff Weisbart, was to take Tony’s deposition. "Have you ever given a deposition before, Tony?" Dennis asked. "No," replied Tony, "But at the Los Alamos Lab I was interrogated by the FBI in the Wen Ho Lee case." "That was different," said Dennis. "They were trying to get to the truth." Next we were ordered to non-binding mediation, which was held in Austin on March 27, 2000. We sat in the room with the mediator, Ms. Vogt and the lawyers. A list of all of the B.H.’s assets were put on a board. Through Geoff Weisbart, Rebecca said that her good name had been smeared and she wanted some kind of statement from the family that she had been a help to B.H. She also asked to be present when his ashes were scattered. Tony agreed to this. He and I were then ushered into another room while the mediator spoke with Rebecca and Mr. Weisbart. After 11 hours we got nowhere. However, at 6:30 pm in the evening, the mediator came to tell us that Ms. Vogt told him that of the more than half million dollars in cash she had acquired, she had bought some land in Arizona and had the rest stolen from her by her business partner, William Lewis Bradberry. She said that all of the cash, over $500,000, was gone. She asked us for one of the three houses in Alpine that B.H. and Ruel owned. Tony and I offered to sell her one of the houses. The mediator said she had no money, so we left, Tony driving back to Los Alamos and myself back to Dallas. I had thought that after Mr. Weisbart discovered that his client was lying to him, he would press for a settlement. It didn’t happen. After several delays, we finally went to trial in Alpine on September 18, 2000, more than two years after we filed our lawsuit . All of the area judges recused themselves from the case because they knew B.H., so we got a visiting judge, Paul McCollum, from Odessa. We were set to start on a Monday morning in the Brewster County Courthouse. I got down there Sunday night, ready to do battle. Before choosing a jury, Judge McColllum pleaded with both sides to try and reach a settlement. She offered us a 70-30 split, with Ms. Vogt getting the 70 percent. We turned it down. During the jury selection, the question was asked, "How many of you knew Barton and Ruel Warnock?" A smattering of hands went up. Then they were asked, "How many of you know Monty Kimball?" A majority of the hands went up. It was then that I recalled a verse from the book of Genesis, "And then there came a Pharaoh who knew not Joseph." Most of B.H. and Ruel’s friends had gone by the wayside. He was 87 years old when he died, and had outlived many of his friends. In a town of only 9,000 people, more of them knew the lawyer, Kimball, than the botanist Warnock. A jury was seated by the end of the day on Monday. Judge McCollum put both sides on notice that he did not plan on continuing the case into next week, and he wanted it over with by Friday. We started presenting witnesses on Tuesday morning. Early on it was obvious that for each witness produced by either side a counter witness was produced by the other side. It was just as Dennis had told me: For every witness we had to testify that B.H. was suffering from senile dementia and Alzheimer’s, they produced one who said he was okay. "We have to prove that he was not in his right mind on the day he signed each of those transfers," said Dennis. However, the one question asked of Rebecca Vogt that I never felt we got a clear answer to was this: "Why did Dr. Warnock want to give you the fruits of 60 years of savings and hard work by Ruel Warnock?" Her standard reply was, "Because he loved me and wanted me to have it." On top of it, the way Monty Kimball drew up the transfers of property now left Tony liable for all of the taxes! Because each transfer of property was designated as a"gift," the estate was responsible for nearly $250,000 in taxes, even though the estate inherited nothing! Rebecca Vogt, who wound up with everything, didn’t have to pay a red cent to the IRS for her windfall. So why would a man I knew very well give away everything he and his wife had amassed over 60 years to a woman who was his companion for the last 10 months of his life? I never got a satisfactory answer to this question, but after looking at the evidence, here is what I think happened. 1) There is no doubt in my mind that B.H. was not doing well mentally. By that I mean on some days he was as sharp as a tack, but on others he did not know where he was or what day of the week it was. It all depended on which day you caught him on, whether you thought he was clear or senile. 2) I think that B.H. wanted to give Rebecca Vogt something, but not everything. If he wanted her to have it all, he would have changed his will, leaving it to her. 3) Knowing that he was "in and out" mentally, Ms. Vogt was able to catch him on a bad day and say, "Remember you said you wanted to do something for me? Why don’t you give me that house." 4) B.H. would give her a gift, then forget about it the next day and the process would be repeated. That’s the only explanation I have for him giving away all of his property in seven separate transactions, on different days. If he truly wanted her to have it all, why didn’t he just make one big gift to her instead of seven smaller ones? Unfortunately for us, we could not prove this conclusively. There was plenty of circumstantial evidence, but no clincher. It all smelled to high heaven, but we didn’t have the dead fish to lay on the table. Dennis said that we needed to alter our approach. He had discovered an example of Texas case law where it was ruled improper for an employee to transfer property to him or herself if there was any suspicion that it was not fair and above reproach. Rebecca had gotten B.H. to sign an employment contract for her, which she altered and had him re-sign the very next day. Each of the transfers of property took place after her employment contract was signed, which according to Texas case law, was improper. Dennis changed our pleadings, feeling certain that the jury would find the transfers suspicious. Tony and I concurred, and felt good about our chances. The jury stayed out for three and a half-hours before reaching a verdict. They decided to give B.H. and Ruel’s house and a triplex rental property back to Tony and everything else to Rebecca Vogt. They found me guilty of slandering Ms. Vogt and but ordered me to pay damages of only $1. I felt as if I had just been kicked in the groin. I thought that we had put on a compelling, winnable case. I could not understand how the jury would invalidate two of Monty Kimball’s transfers, but not the others. If those two were shady, then why weren’t the rest of them? They were all written by the same person. I thought it should have been all or nothing. Ever since the O.J. Simpson trial there has been a lot of discussion about just how intelligent our juries are. It would be tempting for me to say that our jury was a bunch of morons, but that’s the easy argument. I don’t believe that the jury got all of the information they needed to arrive at a just decision, and I also believe that because they were all from the Alpine area, and knew Monty Kimball, they didn’t want to be too hard on him. During cross-examination, Dennis asked Monty Kimball who he was representing during these transfers. Rebecca or Dr. Warnock? Monty replied that his client was Rebecca Vogt. When Dennis asked him why an 87-year-old man was in his office with no legal representation, signing away his property, Kimball suddenly turned white, stammered and said, "It was a hybrid situation." During his testimony, Monty Kimball came across as an incompetent bungler, not a conniving criminal. I guess that the jury didn't want to be too hard on a hometown boy just for being stupid. It didn’t matter now. The verdict was rendered. I left the courtroom and went over to the house to videotape it to show its condition. There was a broken window at the back patio, and a huge leak in the roof in the living room. Then I notified the renters in the triplex about the return of the property to its rightful owners. 1) If you want your children or heirs to have something, give it to them while you are alive. No matter how well composed and notarized your will may be, it can be undone and you will not be around to clarify it. 2) Stay in touch with your older relatives and know who their friends are. Just because they were strong, strapping folks who took no lip when they were younger does not mean they can do so when they get older. I have no respect at all for Monty Kimball and Geoff Weisbart, the two attorneys who represented Ms. Vogt. Unless they are idiots, they both knew that she took advantage of an 87-year-old man when they took the case, but they did it anyway because they knew they would collect their fees. In short, it is my opinion that they are no better than prostitutes — they would do anything for money. I also have to wonder how they can sleep at night. They have caused tremendous hurt to Tony. Can you imagine what it would be like to sit in a courtroom and have someone who did not even know your father argue that he didn’t want you to have anything? Geoff Weisbart never even met B.H. Warnock, yet he lectured the jury on what Dr. Warnock, "really wanted to do." To drive a wedge between father and son, just for your fee, has to be about as low as a person can sink. The most troubling item in this whole affair is that B.H. Warnock’s ashes remain locked up in a lawyer’s office in Austin, Texas, not scattered beside his wife, Ruel, as he wished. When Ruel died, Tony and B.H. scattered her ashes in a canyon that was their favorite picnic spot. B.H. asked Tony to do the same for him when he died. Tony should be allowed to put his father to rest, beside his mother. The only thing preventing this is the selfish and greedy actions of a misguided lawyer in Austin. Dr. Warnock’s 60 years of collections and writings now languish in a storage unit, instead of being shared with the public. Tony is left with a broken heart. Can you imagine how he must feel? How would you like having a strange woman tell you, "Your father didn’t love you. He wanted me to have everything you grew up with." He was crushed by the entire affair. The whole sorry affair has left a bad taste in my mouth about our court system, with no justice for anyone. Somewhere up in heaven I know that Ruel is giving B.H. hell for doing this. Epilogue: On February 12, 2001 in the Jeff Davis County Courthouse, Judge Paul McCollum issued his judgement in the case. He upheld all of the jury’s verdicts, giving possession of Dr. Warnock’s home and a triplex rental unit to son, Tony Warnock. An older rent house and 10 acres of land in Fort Stockton were given to Rebecca Vogt, along with all of Dr. Warnock’s personal possessions. Judge McCollum also ordered Ms. Vogt to return Dr. Warnock’s ashes to Tony Warnock immediately. Two days before the deadline, Rebecca Vogt filed an appeal. She is now represented by L. Shane Stokes in Midland, Texas, after Geoff Weisbart of Hance, Scarborough and Wright dropped her as a client. She is on her third attorney. No date for the appeal has been set as of this writing. His writings and collection remains in a storage unit, awaiting the outcome of the appeal. Despite numerous attempts to resolve this case, Ms. Vogt maintains that she is entitled to all of Dr. Warnock's possessions. Monty Kimball is planning to run for District Judge in an area that covers most of the Big Bend. If he does file for this position as a candidate, feel free to distribute this story, and this Web site's URL to his opponent, and any registered voters in the district. As a matter of fact, you may distribute this story to any person or organization that you wish, without asking our permission.